June is National Adopt A Cat month. 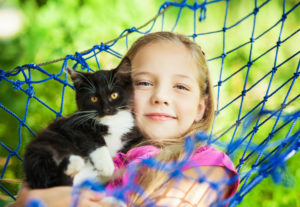 If your kids have been pleading for a cat or kitten and showing you adorable whisker-faced pictures until you’re ready to give in, make sure your home and family are ready for the new arrival. Doing a little research and preparation now will make the homecoming and transition sweeter for everyone. Bringing home a new kitty is an exciting time, especially for little ones. Be sure to talk to small children and toddlers about proper behavior including no tail-pulling and proper holding techniques. Your local library should have a bevvy of books on the subject that you can read to your child so they know what to expect. Whether you adopt a kitten or cat, remember, their world has just been upended so they’ll need time to adjust. When you bring Mr. Fluffy Mittens home, confine him to one room, ideally a bedroom or bathroom. Have all food and supplies ready and if you can help it, try not to put the cat box too close to the food. You wouldn’t want your toilet near the dining room table either. Be sure to spend time in the room with your new family member. Sit quietly on the floor and speak in quiet tones. A shy cat will approach you when he/she is ready while a rambunctious kitten may immediately crawl all over you. Let them go at their own pace. Some cats may prefer a quiet place to hide for a few days and that’s okay too. Kittens may be adopted as early as eight weeks, but experts say waiting 10 – 12 weeks is even better. Reputable shelters and humane societies will offer early vaccines and sterilization service, but it’s important to visit a veterinarian within a few weeks of adoption. Take all adoption paperwork so your vet will have a record of the date and type of vaccines already received. The family doc will also perform his/her initial examination to check for things that may have gone undetected in the shelter and to set up a baseline for future care. When you visit a shelter or humane society, be sure to keep an open mind. While kittens earn high marks for being cuddly and adorable, an older cat can be a wonderful companion for many years to come. Choose the pet that’s right for your family lifestyle.